We see education within the Open Moon project as an extraordinary chance to reach the community and spread enthusiasm for space. 40 years later the community´s power is able to land on the moon! Our aerospace engineer Carsten Scharfenberg has just written an simple introduction into moonflight. What do you have to deal with and what physical challenges you will face. Carsten tells us something about orbits & velocities and space propulsion. 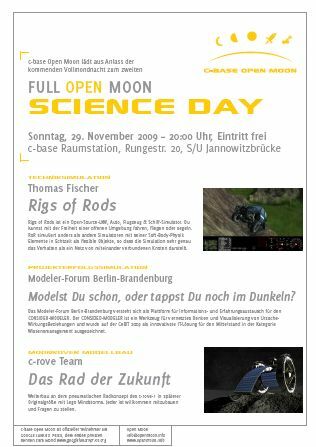 On Sunday, Novembre 29th, we host the 2nd Full Open Moon Science Day onbord crashed space station c-base. This time we focus on “modeling the future”. The construction of the rover prototype is analogical ongoing with Lego Mindstorms. See how it works and help us assembling the c-rove. Digitally there is the `Rigs of Rod´ open source simulation of c-rove´s path on the moon´s surface. A simulation which helps us testing the proof of concept. And another simulation is on the way: The CONSIDEO-MODELER simulates a cause-and-effect chain to explore the success of a project. The Modeler-Forum Berlin-Brandenburg will show us how to work with this KowledgeManagementTool. For children and teenagers in school to get an idea. For interested physicians and the like something rather focused on how you plan to approach things. For business people a paper with ideas to how to make money (moon-tourism, minig). Okay, this is a break, but anyway: Did you ever think about letting medics research on space influence on human bodies? This will only be possible after having sent a greater number of people up there, but who hinders me from thinkin further? I guess you could even have this going after the LunaX Project. You just need to raise interest among enough people, promise your sponsors to include their names in an email from the moon (the 1st email, or the 1st private, as the first would be for the project). That way you could maybe encourage them. Many people have some 5 bugs they could invest in your project rather than into a video game or what not. You just have to raise their interest. You can do this by education. What about Volkshochschulkurse in Moonlanding and how it works. Maybe this is the sector you can support us. Developing education concepts for all groups you cited above. We want generate a sustainable interest for space, even beyond GLXP competition. I can imagine getting into some basics an do some explaination for children or so, but later time. They teach us a bit of paedagogics here, so I maybe coud even get something done. is the link to a discussion on their board where they discuss about how to make the government do more for space research. Maybe they have the necessary people to do the higher targeted Materials. Hey Bejamin, there is no need to be a technician to participate. I´m a enthusiast with a little clue of orbits and rockets. We just need enthusiasm to convince the rest…and just some paedagogic skills. Remind the diversity! super! I just read the “moonshot-for-dummies”. Wonderful written, very easy to understand/follow, just well done. Thanks for your positive response. I´ve forwarded it to the author….